and of course, more Echidna’s were on the move. We had hoped to stop at Roma for the night but found that one caravan park had closed, another had been converted into Dongha’s for FIFO miners, and there was a show on at the Showground which meant no camping there. We drove on hoping to find a camping ground and ended up at Miles. David manoeuvred the Green Machine into one of the few sites available – it was over the remains of the foundations of a cabin that had been demolished. The park appeared to be in the process of being redeveloped. And next morning it was a bit of challenge getting the Green Machine hitched up to the Prado but eventually it was done and we were on our way. We hadn’t planned to go to Carnavon Gorge but after listening to Brian’s description we changed our itinerary. Having left Emerald we passed through the Springsure area, where we encountered drovers on horseback and motorbike, with a large mob of cattle spread out over both sides of the road and along quite a long distance. And you could see the ribs on some of the cattle. We spotted a few Echidna’s – apparently it was the mating season so they were out and about. We pushed on to Barcaldine at the junction of the Capricorn and Landsborough Highways – there are still some old buildings there. We had a really big afternoon at Barcaldine where a lot of political history was made. First of all we noticed the Artesian Hotel. Then we noticed the Tree of Knowledge site, one of Australia’s National Heritage Places, in front of the Barcaldine Railway Station. The site, pivotal in the Australian Labour Movement and the ALP, was where many activities took place around the bitter 1891 Shearer’s Strike. Visiting it so soon after the Stockman’s Hall of Fame, which seemed a more romanticised view, made for interesting contrasts. And it’s a tragedy that someone poisoned the Tree a while back in 2006. ABC reported back then that about 30 litres of chemicals had been poured around over the tree’s roots. 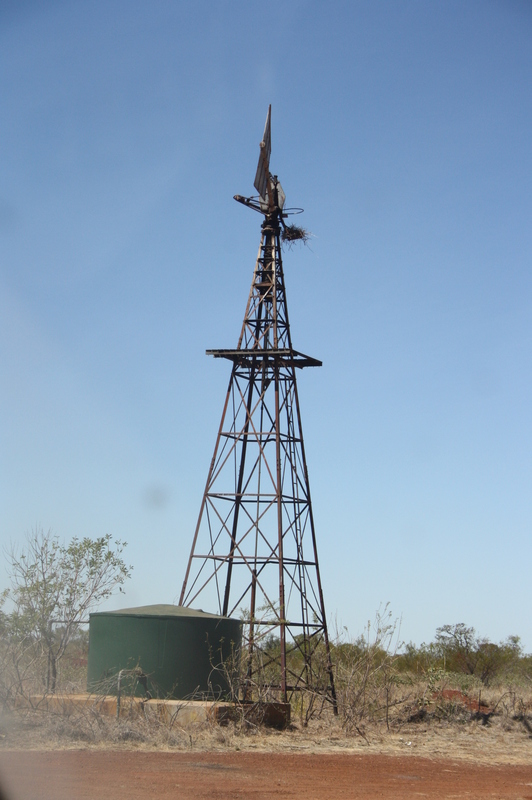 The Windmill nearby had its own story as well – being a symbol of the importance of Artesian Borewater to outback Queensland. It was sad to see the Globe Hotel which had closed in 2011 – although back in April 2013 there were plans for it to be redeveloped as a Visitors Centre and Art Gallery. We peered through the windows and it looked like there was activity going on inside. Down the track, future plans may also run to a library, theatrette and function centre. Dad had an Adams uncle known as Gidge in Boggabilla, so I was taken by the Gidgee Bug Diner next to the Commercial Hotel and down from the Stock and Realty Building. Gidgee bugs are also known as Stink Bugs in other parts of Australia and there is a tree called Gidgee aka the Stinking Wattle. So we’ve wondered how he came to be known as Gidge. Wandering around the corner we found the 1924 Radio Theatre building on what had been the Bank of NSW site. Noticing a sign about an Australian Workers Heritage Centre, we wandered further and found a giant tent with a Eureka Flag flying on top. Back in 1988, the tent had been the main tent in the BHP sponsored touring exhibition to commemorate the Bicentenary of European settlement. But there was so much more than the Big Top – eg extensive displays on the 1891 Shearers Strike. I’m descended from more than a few generations of Shearers, Stationhands and Stockmen and Graziers, and I’ve been of the Labour movement – so, for me this exhibition was fascinating. Striking Shearers were gaoled for their stand – and workers’ relationships with the police deteriorated even further. More widely, the emergence of Labour extended beyond the Shearers and the emerging Federal Parliament – intoRailways, Indigenous People, Women, Health. The Australian Workers Heritage Centre is undeniably a museum with a powerful political message that still resonates. Alas however, we spent so long in Barcaldine that we arrived much later than planned in Emerald where David had hoped to do some fossicking. 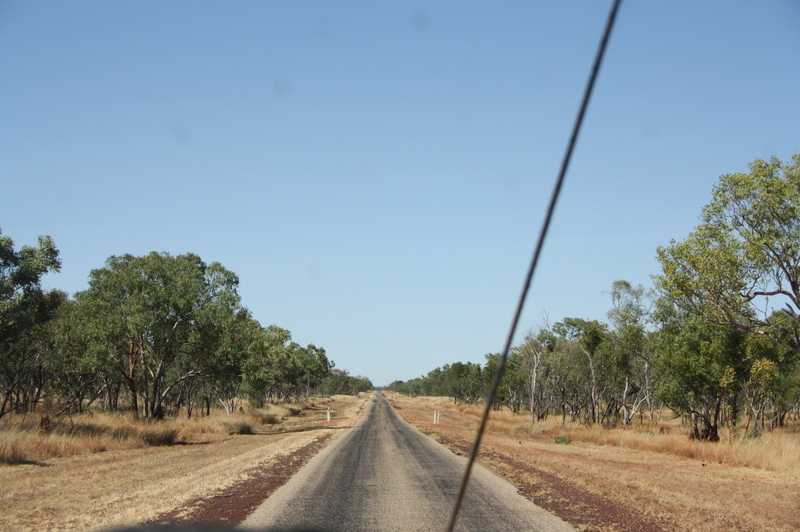 Another long dry drive towards Longreach but at least the road was sealed and for a change and the soil less red – and the rope for the kayak on the roof of the Prado continues to hang down. An afternoon ride around Longreach with Cobb & Co ? 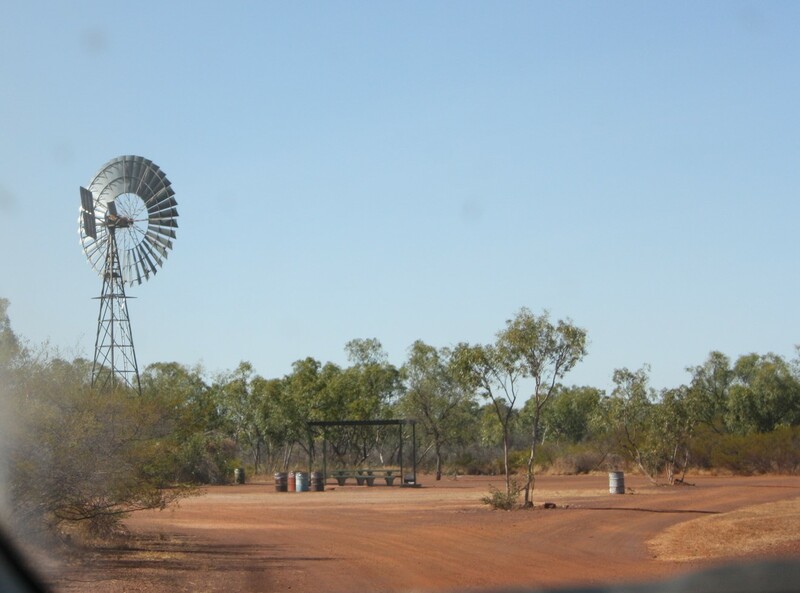 And then time to drop off the Prado for its service – and a pit stop at Winton’s Gregory Hotel – maybe fix the plummeting fuel consumption since the NT and the rear door’s dust issue ? Many of the camping grounds in Outback Queensland have night time entertainment – music or comedians. Winton had one half of a Comedic Duo in The Shed. There was an option for Dinner and Show but we decided on just the Show. So many other places to explore in Queensland Heritage Trails Network ! Shopping for supplies and then a flat battery – after arriving so late in Mt Isa the night before we’d forgotten to unplug the Green Machine from the Prado. A call to RACQ and we were on our way. I wonder how Cape Crawford was named as it is well away from the coast? 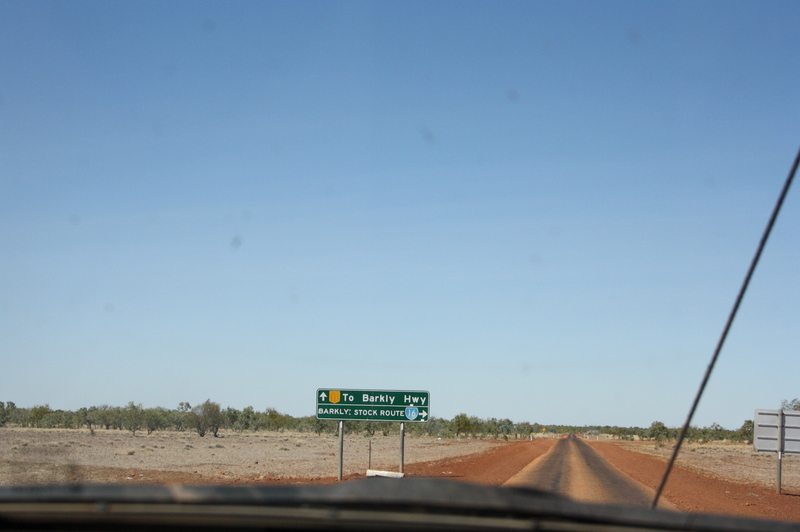 Cape Crawford to Barkley Roadhouse – another long long stretch – though I noticed that the fuel level was plummeting faster than the Prado’s computer had earlier indicated. We had to turn off the air con and drop the Prado’s speed to make it into Barkley – we had maybe 15 -30 kms of fuel left in the tank. Again it was tempting to turn right instead of left and onto Tennant Creek where we’d camped for 3 weeks back in December 1975 when our car broke down. We’d been trying to do the big lap around Australia back then … one day…. Today we planned to stop overnight at Camooweal – but we arrived to find the road blocked off with TV cameras rolling. Surely there couldn’t be a protest at Camooweal? The place was jumping and crowded with the annual Drovers Camp festival. We tried to find a camping spot from the folks at the Camooweal pub but alas no luck. We kept heading east and ended up at Mt Isa – well after dark.So it was a rare night at a motel in the Isa, instead of the Green Machine.